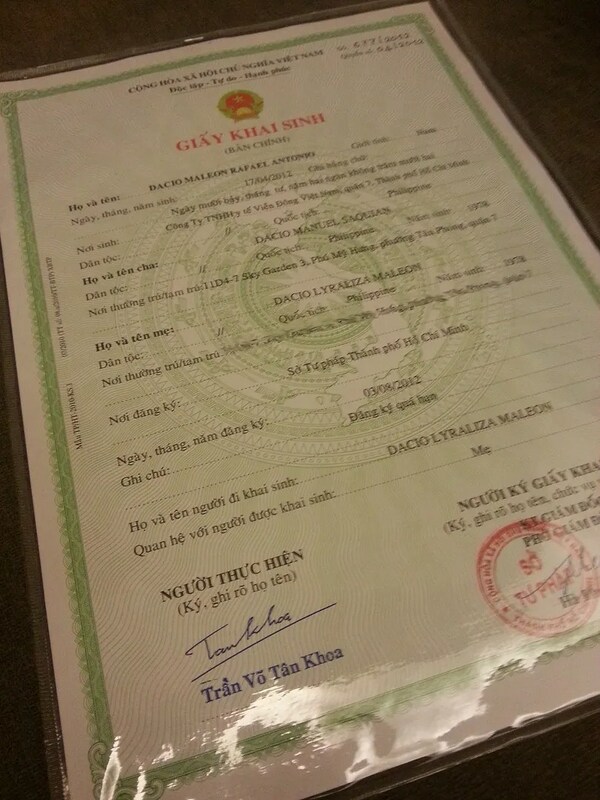 How to Get a Birth Certificate in Vietnam: A Summary | Hello Saigon! 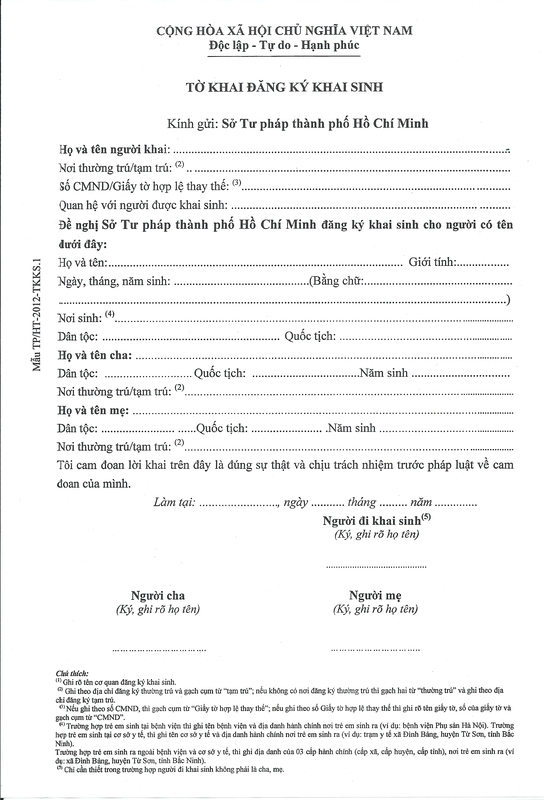 But I will go ahead and summarize in this blog post on how to get a birth certificate in Vietnam. First though, I would like to clarify some things on the nationality of a child born in Vietnam from foreign parents or Vietnamese-foreign parents. Technically, only those born from Vietnamese parents are considered Vietnamese. However, if the foreign parents fail to agree on the nationality of their child, the child is then Vietnamese. Reference is from Resolution No. 51/2001/QH10. 1. A child born inside or outside the Vietnamese territory either of whose parents is a Vietnamese citizen and the other is a stateless person at the time of his/her birth or whose mother, at the time of his/her birth, is a Vietnamese citizen and whose father is unknown, has Vietnamese nationality. 2. A child either of whose parents is a Vietnamese citizen at the time of his/her birth and the other is a foreign national has the Vietnamese nationality if so agreed in writing by his/her parents at the time of birth registration. In case a child is born in the Vietnamese territory but his/her parents fail to reach an agreement on the selection of his/her nationality, the child has Vietnamese nationality. 1. A child born in the Vietnamese territory whose parents, at the time of his/her birth, are both stateless persons with a permanent residence in Vietnam has Vietnamese nationality. 2. A child born in the Vietnamese territory whose mother, at the time of his/her birth, is a stateless person with a permanent residence in Vietnam and whose father is unknown, has Vietnamese nationality. So let’s go back to the topic, how to get a birth certificate? Step 1: Prepare all necessary documents. Step 2: Have all English documents translated to Vietnamese and notarized. Here, you have to the People’s Committee (47 Le Duan St., D1 | Open: M-F /Sat (half day)). For translation and notarization at the People’s Committee, you’d have to pay roughly 100,000 VND each document. If you’re just going to have it notarized, it’s much, much cheaper. Transaction time is 3 days. Step 3: Have all translated and notarized documents authenticated. Here, you go to the Department of Foreign Affairs (6 Alexandre de Rhodes St., D1 | Open: M-F / Sat (half day)). Upon entering the premises, get your ticket number by the guard house and go directly to the small office at your right behind the guard house. Transaction fee is at 30,000 VND per document. Transaction time is 1 day. Step 4: Apply for birth certificate. Pass all Vietnamese authenticated documents to the Ministry of Justice (141 & 143 Pasteur St., D3 | Open: M-F). Once you enter the MoJ, you have to have your documents checked for completion at the small office at the right before going up the main building. If all documents are in order, you will be asked to go to the main building to pass your documents. The windows in the MoJ are labeled in English so I don’t think you’ll have a difficult time. Transaction time is 4 days. If you failed to submit the documents 60 days after giving birth, you’d have to pay a fine. Step 5: Get the birth certificate, apply for English translation, and authentication. You shall receive the Birth Certificate in Vietnamese which you can have translated into English in the MoJ. I opted to have ours translated in the People’s Committee and notarized. Again, we had to go to the Department of Foreign Affairs for authentication of the document and had it re-authenticated in our own embassy/consul. Voila! Birth certificate ready for passport application! Approximate days of transaction is around 20 working days. Be prepared to spend a month on this. This entry was posted in Exploring Saigon, Spills and tagged Birth Certificate, Department of Foreign Affairs, How to get a birth certificate in Vietnam, Ministry of Justice, People's Committee, Vietnam. Bookmark the permalink. Pingback: Certification for Child’s Nationality | Hello Saigon! If parents had not registered the birth of the child, then they can apply for late registration or re-registration of birth. The process differs from region to region. My parents are Vietnamese, but when I was born in Italy they lost their Vietnamese citizenship and got the Italian ones, so actually if they’ll get back the Vietnamese citizenship, can I apply for it as well? Hi Angelo. I came across this law when I was working on a project, Law on Vietnamese Nationality. Check out Chapter 2, Article 15. Thank you very much for your kind answer! Well, my parents weren’t VN citizens anymore when I was born, but if they’ll ask to get back the VN citizenship, I can ask for it as well, right? Hi, Can you help me by any chance please (clutching a straw!). I was born in VN but came to UK in 1984 as a refugee. I eventually applied for British citizenship and was successful. In any case, I married in 1994 to a British man but divorced in 2006. The wedding was a long time ago and I cannot recall how we went about it (probably because my ex sorted everything out). I am now considering getting married again and I saw that my birth certificate will be required which I do not possess. I don’t want to go to VN to apply for this. The VN embassy in London said categorically they cannot deal with this kind of request. I don’t know what to do in order to obtain one. Your advice would be much appreciated. Hi Tosca. Do you have family here in Vietnam? You can ask a relative to get you the birth certificate at the Ministry of Justice. Would probably be best if you send a letter of authorization. hỏi Tiếng việt đi, còn trả lời được, tiếng anh ko biết đâu. Pingback: Getting a Vietnamese Birth Certificate for Japanese, Brits, and Aussies | Hello Saigon! I’ve read your posts with great interest and hope that you can help us. A very good family friend is in the process of remigrating to Vietnam, but the lack of official papers threatens to stop this. Our friend escaped Vietnam in 1983 and ended up in The Netherlands and currently holds the Dutch nationality. When he left Vietnam, papers like birth certificate etc were lost. Over the last years, both his parents have deceased, but his brother and sister are still alive. The thought of going back to Vietnam has always been in his heart, and with a current job opening within reach, he is trying everything to realise that. He is currently in Vietnam to try to get the Vietnamese nationality. When he went to the authorities, he was denied this because he doesn’t have a birth certificate. The municipality in which he was born have lost all their birth records from those days, so he isn’t able to get a copy there either. What things could he do so that he can obtain Vietnamese nationality? His brother and sister are prepared to vouch for him but I don’t know whether this is a possibility. He is in Vietnam until the 20th of July so any advice that you can give I’ll get through immediately so that hopefully he can security his nationality. Thanks so much for your, and anyone else’s help! Has he gone to the Ministry of Justice? All birth certificates are centralized there. Let me find the law on remigration. Basing from the law http://www.moj.gov.vn/vbpq/en/Lists/Vn%20bn%20php%20lut/View_Detail.aspx?ItemID=10451 your friend should have applied for Vietnamese nationality withing 5 years from the effective date of the law. Unfortunately, the 5 years has expired. He should consider getting a lawyer to help him on this. Excellent post. Clear and detailed. However, I did have a question. I am an Indian national and my wife is Vietnamese. However, both of us don’t stay in Viet Nam. My wife delivered our son in Ho Chi Minh City, where she belongs. Question is, are the original documents required at every step of the way? I was hoping to come there for a day, submit my documents for translation, and then my wife can complete the formalities. Marriage cert in original is no problem, but I can not travel without my passport! The passport is only photocopied and authenticated. Thanks for this information. I live in Australia but was born in Vietnam in 1977. My parents are Cambodian and we escaped from there. We have VISA’s but I want my birth certificate. I have no idea if I can get it, it all seems so complicated. Can you suggest if this is possible for me? You have to check with the Ministry of Justice. I am a British citizen , been living in Vietnam and recently married a Vietnamese woman ( under Vietnamese law ). We have just discovered that my wife is pregnant and we would like if possible for our baby to have duel nationality. I have a factory in London and have had to return to UK to take up my position as Managing director after the recent loss of my general manager, and my wife will be joining me in London later this month and has just been granted a multiple UK entry family visa. I would imagine that we will opt for the baby to be born in UK , and will subsequently have a british birth certificate. However , I would like that baby has duel nationality if possible . Hi. Sorry. I am not familiar with this. Please contact your embassy. My friend was born in Vietnam he is approximately 42 yrs old. He lost his birth certificate. How does he get a replacement? He has to go to the Ministry of Justice. Pingback: Philippine Consulate Office HCMC New Office Schedule | Hello Saigon! Hello, Going through the process of getting my daughter her birth cert, me and my partner are both English but unmarried so i’m assuming i just register her in my name and details only. Did you have to have your birth certificate as well at any point? i have a copy of mine but trying to avoid going to British embassy in Hanoi to get it certified if its not necessary. Hi Sarah. No I didn’t need to show my birth certificate but ours may be a different case since we’re married and we had to show our marriage certificate. I’m not sure how it is for your case. Hi Lyra ! Pleases help me ? Helo im sarah and im from philippines? Can i have a question pls? Im pregant now for 5months and my fiance is vietnamese, so we decided that i give birth here in vietnam.. but im just wondering if still have a posiblity that i can bring my child in my country even me and my husband is not yet married after i give birth(financial problem).. but my child will be a vietnamese citizen here in vietnam because that’s my fiance want to be.. so im a little bit scared that i cannot bring my child out of this vietnam country because i dont know how long im ginna stay here in vietnam? I hope you send me answer as soon as possible.. pls send me a message to my email add.. phansam615@gmail.com or sarahphan@gmail.com.. thank you and have a noce day.. 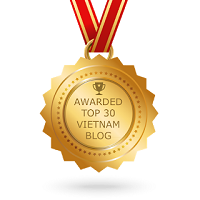 I am an American expat in Vietnam married to my Vietnamese spouse. We just had a newborn in Ho Chi Minh City and want to obtain a birth certificate to apply for US citizenship for our newborn. Does anyone know how to or have an example of a proper Affidavit of the Child’s nationality to give to the United States Embassy to authenticate? Our consulate was able to help us with that. If mother is Viet, father is foreign. And parenst want the child to be foreign citizen. So do they still need to name the kid a vietnamese name to get a birth certificate to then apply for foreign items? I am a catholic Priest from Pondicherry,India. I came to know of a sevant of God bearing the name Joseph Tamby from pondicherry . Leaving the family he lived in Kerala and Andhra as a franciscan brother of 3rd order.immitating the poverty of Christ till his death on Jan.15, 1945 .There is no record of his birth. His parents Savarimuth Tamby and Annammal seem to have lived in Vietnam.arounf 1982 to 1983.. his birth certificate is needed for his beatification. Kindly joint the search team. Br. Joseph Tamby will abundantly bless you. I am a catholic Priest from Pondicherry,India. I came to know of a sevant of God bearing the name Joseph Tamby from pondicherry . Leaving the family he lived in Kerala and Andhra as a franciscan brother of 3rd order.immitating the poverty of Christ till his death on Jan.15, 1945 .There is no record of his birth. His parents Savarimuth Tamby and Annammal seem to have lived in Vietnam.around 1882 to 1883..His birth certificate is needed for his beatification. Kindly joint the search team. Br. Joseph Tamby will abundantly bless you. Wow…Very Informative article , i just need of it , it is actually useful for the peoples, i enjoy by reading blog. Birth Translation cerifiction are being neccessary day by day, every person new born babies too , they all have rights to get their birth cerficate . So , we all need to give high priority to it. Very nice information you have updated here , i am biggest fan of your site. Thanks for sharing , I have enjoyed a lot your post. It is well explained about a Specific topic.I am also a Translators , and of course i had done many more projects. I hope your article will teach me to do something else different. I and my wife are pakisatani and we are planning to have alitychild in vietnam.. can our child get vietnam nationality ??? or eventually with our child vietnemaes nationacality , can we get vietnamese nationality???? pakistani tournatist new born baby can get vietnamese nationality???? Thanks for the great information. Do i need to leave my passport with MOJ during these period? or they’ll just inspect it and give it back to me as i am currently working overseas and my time in Vietnam would be limited. No you don’t need to leave your passport. i still need to show them the original passport correct? after inspection, they will return it to me? Hello! 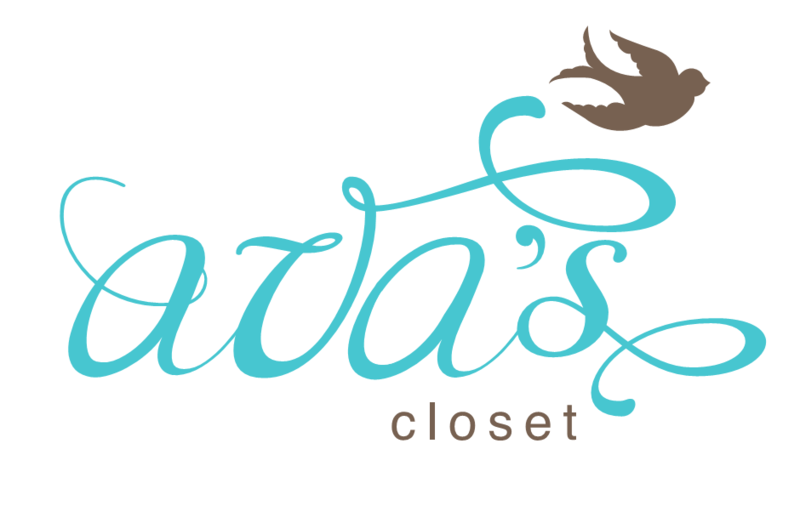 Thank you for the post ! i have a question , can a baby get birth certificate without marrieage certificate ? Hi Shristi. Process the same way. I guess you’ll be asked to submit another form/affidavit stating the parents names. Do check at the Ministry of Justice. I have a question? I have to take my Citizenship test and have passed it but now they asked me for my birth certificate which is I never have mine cause I left my Country when I was a little. So I asked my mom or my sister do it for me in Vietnam but they said they couldn’t do for it for me. Neither birth certificate or affidavit. Can anyone help me please do I need to write an authentication letter or anything? Thank you! hello I’m just wondering how can I go on about getting my birth certificate in Vietnam. I called the Vietnamese embassy in Canberra Australia. They told me that I have to go back Vietnam to apply. Hi. You have to get it from the Ministry of Justice. Ministry of justice in Vietnam? Yes. In Vietnam. Or ask someone you know who can do it for you.